For the biscuits, preheat oven to 450 degrees F.
Add the buttermilk and stir until just combined. The dough will be pretty wet looking. Transfer dough to a floured surface and gently shape it into a rectangle about 1/2-1 inch thick. Fold it over about 5 times or so, ending up with a piece of dough that is about 1-inch thick. Use a 2-inch round biscuit cutter (or a glass that is about 2 inches wide) to cut out 10 rounds. Place the rounds on a cookie sheet with the sides touching. For the sliders, heat grill or frying pan to high. Quickly sear pineapple on one side until it is slightly charred, about 1-2 minutes (don't leave it on too much longer as you don't want it to dry out). Spread the bottom of each biscuit with about 1 Tablespoon of Spicy Honey Mustard. Lay one piece of pineapple over the mustard. 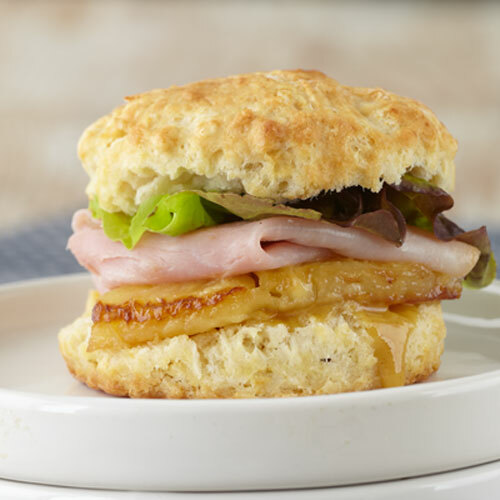 Layer on a few slices of ham, folding it gently as you go so that it fits the biscuit. Top with a piece of lettuce and the top half of the biscuit.